The town of Sechelt is nestled on a narrow isthmus of land with the Strait of Georgia on one side and Sechelt Inlet on the other. The name Sechelt actually means "land between two waters" and was named after the shishalh who are the original First Nations people of the region. To access the area, travel northwest on Hwy. 101 (Sunshine Coast Highway) from Gibsons approximately 23 kms. I've included the Porpoise Bay, Sandy Hook, and Tuwanek areas into the Sechelt general area. Many of the trails that follow along the powerline or connect to the powerline access road have no names. These trails are generally appropriate for both hikers and bikers. Other than the Heritage Trail which is easy, I would rate these trails as intermediate. There is some blow down and minor obstacles on some of the trails as well. I will be adding a page for Kinnikinnick Park and trails in the near future. 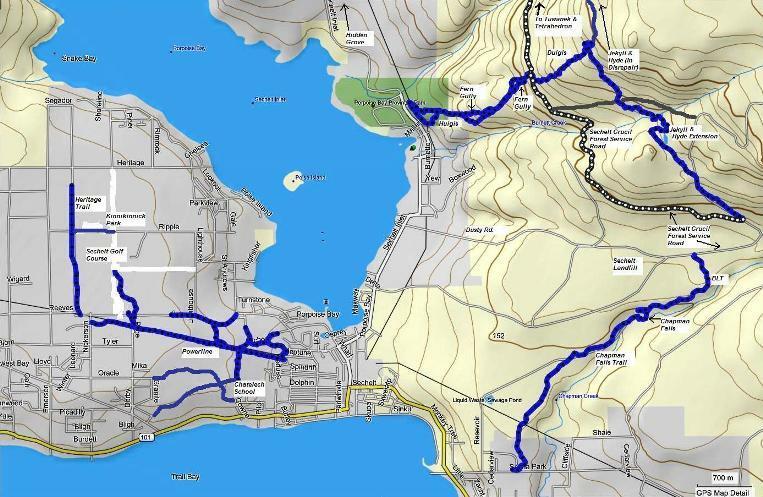 Click here to return from Sechelt Trails map to Sechelt trails. Click here to return from the Sechelt trails map to the Sunshine Coast Trails Home page.